This picture looks great and I am sure the taste too will be wonderful. 'l try it before the week runs out. Keep up the good work. Thank you For your yummy yum yum comment. Thank you Mona.You made me smile.I did visit your site.Keep it up. Thank you for the effort you put in...will try this today! First of all, thank you for posting this recipe. I have a question regarding this: in the step where you partially cook the rice, approximately how long do you need to cook the rice? 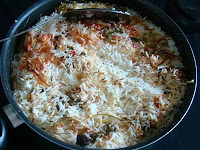 After adding the rice, should we cook on high flame, say for 6-7 mins or lesser? If you have a pic of the partially cooked rice, it would be great. Is there any way to know its 2/3 cooked? Please let me know. I tried Mona's recipe from zaiqa.net and loved it. was reading your recipe and seemed interesting so would like to try this too! 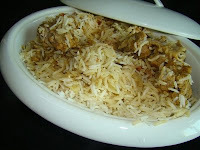 Thank you for the interest in this recipe actually the cooking time for the rice depends on the basmati rice you use aged rice/ new harvest brand etc so it is not possible to tell u the time as a rule of thumb you have to keep checking after say approx 5-7 minutes n press the boiling grain between your finger and thumb and if it breaks into 3 bits without much effort it is two thirds cooked before this stage you will notice the rice breaks into two bits on the test then you have to wait for the 2/3 to happen.yes the water has to be boiling n bubbling when u put the rice in.Try it and u will not be disappointed it is an authentic recipe passed out from generations of cooks.Also keep checking out for new post. Cheers.